This hotel is located near Arnold Mackinac Island Ferry Mackinaw City Center Thunder Falls Waterpark Old Mackinac Point Lighthouse Little Bear East Arena University of Michigan Biological Station and Nubs Nob Ski Resort. 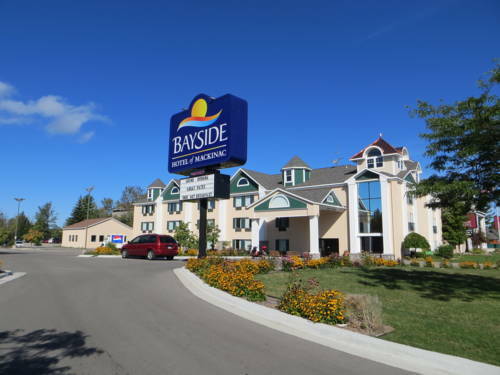 The Bayside Hotel of Mackinac offers guests an indoor pool free hot breakfast served from 7 am to 10 am free highspeed wireless Internet access faxcopy service free parking wakeup service and small pets are accepted with additional charges. Guest rooms offer free highspeed wireless Internet access coffee maker cable TV with extra stations hair dryer ironboard air conditioning alarm clock and electronic door locks. Requests are not guaranteed and will be granted based on availability at checkin.